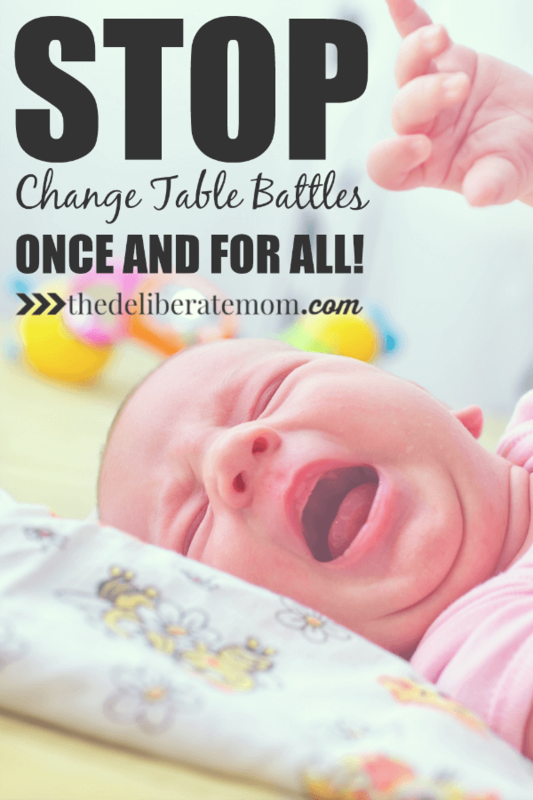 Stop the Change Table Battles Once and for All! Imagine you’re reading the best book ever or that you’re chilling out on the sofa after a hard day at work. Suddenly someone picks you up and carries you to a table, then proceeds to take your pants off! Would you not completely freak out?! I know this is a bit of a stretch, but you get the point right? By doing this, the child is prepared for what is next. He also knows that the activity he is engaged in, will soon be interrupted for a diaper change. You can do simple things to involve your child in the process. Let him select the new diaper or invite him to hold the wipes for you. Diaper changes could quite possibly be one of the most boring things your child does in the day. Multiply the boredom by how many times the process is repeated and you’ve got a recipe for conflict.Diaper changes can be made more appealing by hanging a mobile over the change table or perhaps you could rotate photographs on the wall by the table. You could also encourage the child to select a book or a soft toy to hold onto during diaper changes. These little things could make the diapering process more enjoyable for him. The routine of diaper changes is often overlooked as an opportunity to connect with a child. This is a great time to sing songs, tell stories, or share a rhyme. If your child is kicking, hitting or struggling, then perhaps they need a change of scenery. Change them on the floor instead of on the change table. So this takes a bit of practice but it’s fantastic for an active child. Sit on a low chair or a stool in front of the child. Have them face you. Remove the diaper. Wipe. Place diaper on them while they are standing. Do you have any tried and true ways to make diapering time more fun and less of a battle? Please share and help a fellow mom out. Also, if you have a question that you would like to have answered here on The Deliberate Mom, please send me an email. I’ll do my best to help out. This is great advice – if you let your baby or young toddler know what to expect, it helps them cope better with what’s coming. It’s part of treating children as tiny people to be respected rather than objects to be hauled around…. Now my toddler’s older (she’s nearly 2) she tells me what’s going to happen when I change her because she’s used to me talking her through the process! Thanks Jo! Yes, I think it’s critical to talk to them and treat them with respect. They are little people who deserve to be treated with respect and kindness. Thanks so much for stopping by and sharing your own perspective as well. It’s nice when they get to that stage of wanting to get through it as quick as possible! You make me laugh my friend. Well, if readers write in for advice, I’ll do my best to share. These are great ideas, and I love the advice column idea! For Panda we keep a small basket with a lot of little toys that are just for diaper changing time. We change which toy each time and sometimes let him choose for himself. He does not play with the toy really because we do sing and do rhymes with him while changing, but it’s a place for him to put his hands while he is being changed. Thanks so much! Well, if people write in for advice, I’ll make sure to do my best to answer their questions. Distraction with a toy is always awesome! Thanks Susannah! You’ll have to pin this on your “baby” board *wink*. So excited for you guys! I think an advice column is a great idea! I’ve always been obsessed with them. I’d love to have a photography one someday. My son kicked me once while changing his diaper. That was very upsetting but it hasn’t happened since. If so, I’m doing this. Well, I’m hearing a lot of people saying to do an advice column. I guess I have to hope readers write in… right? Thanks for visiting my friend. Hopefully you don’t have to use these tips! Such good advice, Jennifer. Cash likes to hold the diaper cream and open and close the flip top while I change him. Sometimes he also likes to put a little dab on his finger and help me wipe it on, which can get a little messy. :) Thanks for all the helpful tips! I’m glad you enjoyed this Mia. My youngest does the diaper cream thing too. The little “mess” is so worth her contentment. So glad you enjoyed this Carolyn! Those wigglers can be challenging, that’s for sure! So glad you enjoyed this Tiffany. You’re fortunate that Little A was so easy peasy during diaper changes… yay! I love this! I was asked to do this – and do it as a video portion of the blog because I’m a reporter. I don’t think it’s presumptuous, but shows your character that you were so thoughtful! Great advice by the way…we have this battle as well! Am sharing this for you! Thanks Kristen! Well now I have to hope that people write in for parenting tips! Glad you enjoyed and thanks for sharing! You DO get extra points for diaper changing in the dark! Way to go! I think you should definitely add this to your blog because I’ve been wanting to tell you without freaking you out that I’ve secretly added you to my top 3 parenting gurus list, haha! My midwife, a wise friend of mine, and now you! I don’t often add anyone to my little list that I keep inside my head, but I just think you are such an awesome role model for other moms! I definitely would love to hear what you have to say in response to parenting questions! I loved all your tips too by the way. I definitely always found that if my baby knew what to expect, things went much smoother. Jessica, your words have blessed me. A few days ago when my blog crashed and I thought it was gone forever, I contemplated quitting. Your words reaffirmed why I love blogging… sometimes by sharing a thought, a process, or a story, we help others. I want to help others. I want to serve others… this is a wonderful way for me to do so. I am flattered that I’m one of your top 3 parenting gurus. Truly. Thank you. LOL Sanz… gross but I hear you! Gee I’m glad I’m past this stage in life! Thanks for sharing at the Say G’day Saturday linky Party!. I just shared your post on Twitter and G+. Yes, it’s definitely a stage that not very many parents “miss”. Thanks for sharing my post Natasha! I appreciate it so very much! I’ve been changing diapers for the last 2 decades, so I’m pretty efficient at it. I have an organizer that hangs off the table, and I always keep a few small toys in there to occupy little hands. It’s a great teaching time, too. My girls learned their English body parts from practicing on the changing table. Two decades of diaper changes. Oh my, that would give you some expertise wouldn’t it?! 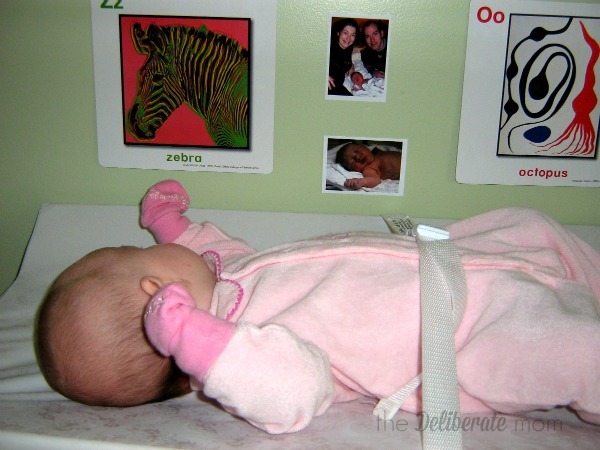 Change table time is a wonderful opportunity to add learning experiences. Thanks for sharing Shecki! Eight kiddos here … and yep– the floor is the best place. I also sing songs, teach body parts, colors, etc., and employ older siblings to be entertainment! This is such a great article! I think it’s so important to show respect for your little one and use this time for special bonding. My little guy is still young (3.5 months), but adding a few things into our routine transformed diaper changes from a traumatic experience to a time filled with smiles and giggles. I always start by letting him know that I’m going to change his pants and then give him a big hug and kiss. I get my supplies ready and then always keep at least one hand in contact with him until we are done. We smile and sing songs throughout the diaper change and I tell him what to Expect next. (Time to take off your pants. Now I’ll use the wipe. It’s a little cold. Etc.) I end with another big kiss and let him know that I’m going to wash my hands and I’ll be right back. I know he’s still small, but I strongly believe that adding this routine has helped make diaper changes much more positive at our house!